World Press Photo is committed to supporting and advancing high standards in photojournalism and documentary photography worldwide. 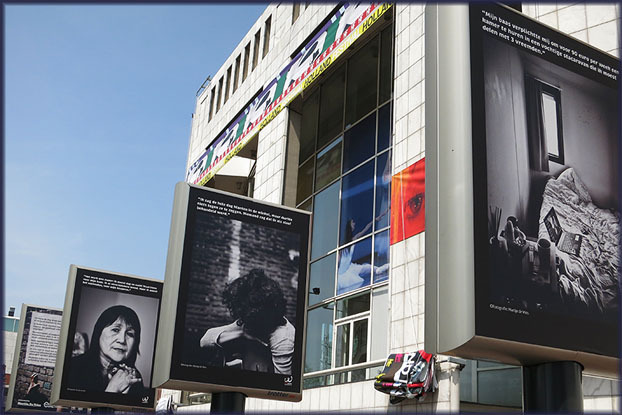 The activities include organizing an annual contest, exhibitions, the stimulation of photojournalism through educational programs, and creating greater visibility for press photography through a variety of publications. 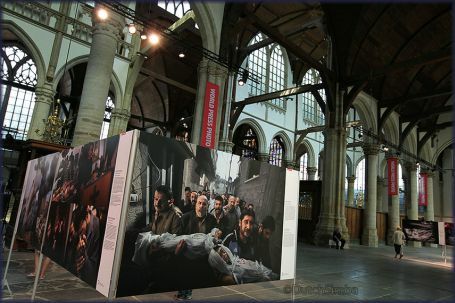 This exhibition was visited on 18Jun13, during the last week of the exhibition in 'De Oude Kerk'. This week in Amsterdam (at the Stopera, near the Waterlooplein) I came across a recently opened exhibition (19Jun13), outside, commemmorating 150 years ago the Netherlands abolished slavery in the Dutch colonies. Historians agree that in all the Dutch shipped about 550,000 African slaves across the Atlantic, about 75,000 of whom died on board before reaching their destinations. Global trade, ships crossing oceans and trading done by many nations, existed for some 300 years. In that period an estimated 27.5 million people were uprooted, 12.5 million of these were Africans. This exhibition shows slavery still exists through prostitution, trafficking, exploiting illegal immigrants and other cheap labour. Next months it will move to a different location in Amsterdam and afterwards will travel through sveral cities. During a recent visit to Bredevoort, a socalled 'book town' in The Netherlands, I stumbled on this little treasure. The book was published by Random House in 1996. It covers photos of 55 writers at their desk over a period of 1971 - 1996. The above photo does not represent the lay out of the book, as it has a photo on one page and the facing page has the text on how or when the writer produces the fruits of his or her labour. Philip Roth is a bit of a spoil sport, as he declines to divulge that kind of information, proclaiming he doesn't ask other writers how they work either. Fifty five writers (including Roth) are photographed at their workplace; their apparatus differ, either by choice or perhaps due to the time of interview: one did not have laptops in the 1970s. To name but a few of the writers in this book: Stephen King, John Irving, Amy Tan, Susan Sontag, Kurt Vonnegut, James A. Michener, Joseph Heller, Georges Simenon, Tennessee Williams, Saul Bellow; and many others. Included is a very nice introduction by John Updike. 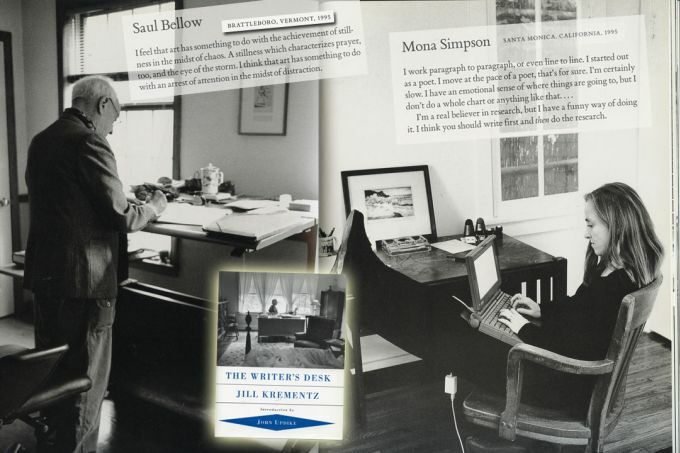 Jill Krementz (b.19Feb1940) is a photographer and author; she has published some 31 books, mostly of photography and children's books. She got a Nikon camera as a birthday present when she became 21 (1961). 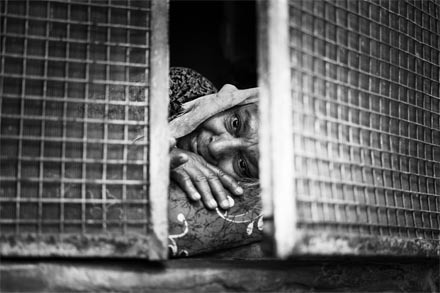 As to working as a photo reporter, she built a life on it. In the 1960s she worked as a photographer for the New York Herald-Tribune. Krementz later specialized in the portraiture of writers. She is the widow of author Kurt Vonnegut. 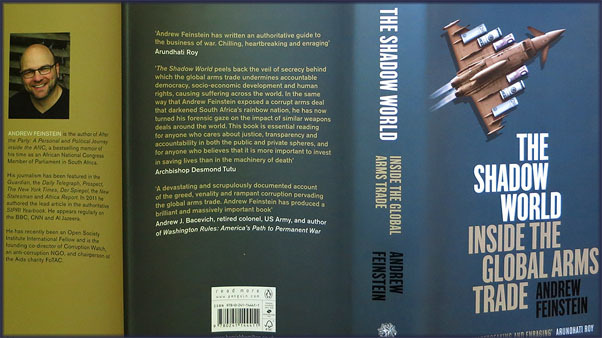 This massive effort by Andrew Feinstein to dissect the global arms trade has result in a thoroughly fascinating book and a hugely important document. A monument in investigative journalism. While the larger defence contractors like BAE and Lockheed Martin - the formal industry working hand-in-glove with government - would have us believe they are distinct from and should not be tarred with the same brush as the apparently shadier world of the black and grey trades, the reality is different. The formal and clandestine worlds interact and intersect far more regularly than they would admit. And their dependence on each other is profound. Both form, in effect, the shadow world. While some form of arms industry is required in the dangerous and unpredictable world we inhabit, its special status and its intersection with the grey or black criminal world result in enormous costs to ordinary citizens and taxpayers, as the case of Lockheed Martin so amply demonstrates. Even the jobs produced by the arms trade cost significantly more to create and sustain than in any sector (e.g. education or care), with larger amounts of public money spent on them. There is a fundamental consequence too: the diminution of democracies where they exist, and the entrenchment of undemocratic, often barbarous states, such as Saudi Arabia and Iran. National security concerns, while sometimes legitimate, are often used to hide information about malfeasance that would in no way undermine security. The global desire for weapons and matériel shows little sign of abating, despite the economic difficulties of the past few years in most developed countries. There will be no change in the way in which the arms trade operates unless the biggest producer and consumer of weapons, the USA, is willing to change. The reality is that the 'Sheriff of Global Democracy' is in no way an example of morality, what with the war in Iraq started under falls pretense (G.W. Bush Administration), disregard to national sovereignty during rendition programs, continued disregard for human rights as publicly displayed by the US detention center on US Naval Base Guantanamo Bay and increased persecution of whistleblowers (e.g. Bradley Manning) by the Obama Administration (in fact a follow up policy to the statement made by G.W. Bush: "Either you are with us, or you are with the terrorists"). Not a country whom we should expect to set a good example. During the course of the 20th century, the trade in arms made viable and fuelled conflicts that cost the lives of 231 million people. The first decade of the 21st century has, if anything, been more violent. Closing with a quote from Naom Chomsky- "This shocking exposé unveils a shadow world of corruption, greed, slaughter, and other horrors, tawdry and gruesome in its criminality. It must be brought to a quick and final end." Thoroughly enjoyed this book, particularly because its style is so different from what I am used to. Main character is Sir Edward Feathers, a retired judge. Filth is an abbreviation: Failed in London, Try Hong Kong. Born in Malaya to a mother who immediately dies and a father who is traumatized World War I; Eddy is shipped home (England) to starthis education, to prevent him from becoming 'a native'. He passes through foster parents, his formative years dominated by feelings of being unloved and abandoned but seemingly uneffected. From this period he carries a dark secret with him. The book switches from past to present, the style colourful as it is through Eddy's eyes we see the changed world, the present so different from his difficult youth and the glorious years of his faded career. And he is so advanced in age, as well as effected by the recent death of his wife Betty - his anchor in life - that his mind gets clouded and confuses past and present at times. 'He talks like one of those Channel Four characters..' remarks someone who has been adressed by Old Filth. But he remains endearing: Eddie, the Judge, Fevvers, Filth, Teddy and Sir Edward Feathers. Very pleasant reading, I dare say! 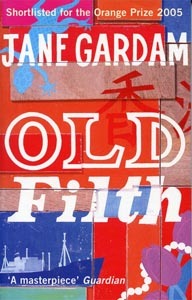 Jane Mary Gardam OBE FRSL (born 11 July 1928) is an English writer of children's and adult fiction. She also reviews for The Spectator and The Telegraph, and writes for BBC radio. 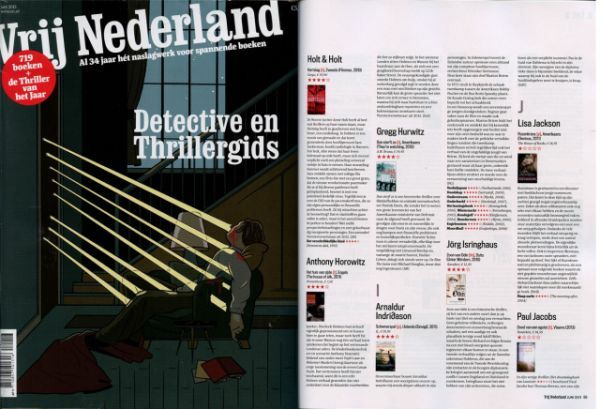 This past week saw the yearly publication of the 'Detective- en Thrillergids', a hugely informative guide on crime writing published by Vrij Nederland. It proclaims to discuss 719 books this time and I must confess I haven't checked that number. There is also an article on tv series to the same effect of suspense and crime. Interviews include Nele Neuhaus, R.J. Ellory and my favourite crime writer: Arnaldur Indriðason. Brief interviews include Jo Nesbø, James Patterson and Lars Kepler (to name only a few). It will be nice to browse these pages and update my 4- and 5-star list for future purchases. 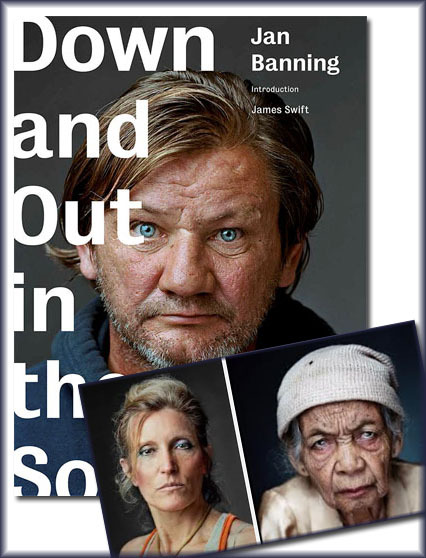 In 'Down and Out in the South', Banning has photographed 42 homeless men and women in Atlanta,GA., Columbia,SC and in the Mississippi Delta. While not the first to photograph modern society’s outcasts, his approach is different. Eschewing caricaturizing depictions, Banning places his subjects in a studio setting without their stereotypical belongings, focusing instead on their individuality — on who they are rather than what they are. It provided for very powerful portraits and an interesting document. For the past few years I have been buying these yearly publications by Reuters. This edition of Our World Now captures world-wide key events taken place in 2012 in more than 300 powerful photographs. The 18x18cm sized book is organized into 4 sections, representing the 4 quarters of the year. The images cover the full range of global reporting: politics, commerce, conflict, the environment, natural disasters, faith and festivities, entertainment, celebrity, and lifestyle. 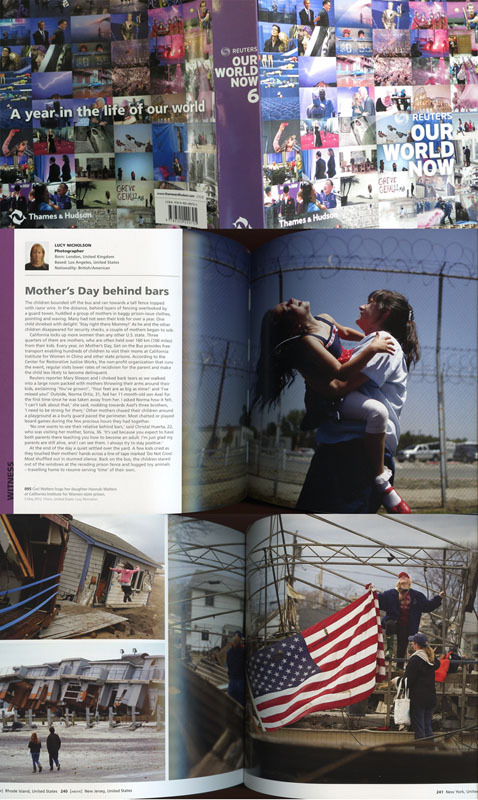 The book provides an indispensable visual record of our times, while the top-quality news photography is something to be admired in itself. 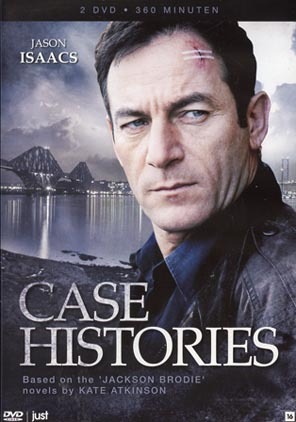 'Case Histories' is a British drama television series based on the Jackson Brodie detective novels by Kate Atkinson. This dvd box contains 6 episodes, filmings of the books 'Case Histories', 'One Good Turn' and 'When Will There Be Good News', all written by Kate Atkinson. I'd read these books over the past few years and really enjoyed the writings by Kate Atkinson. These series do excellent justice to the books; an excellent performance by Jason Isaacs as Jackson Brodie with unmistaken chemistry between him and Amanda Abbington (DC Louise Munroe) and the boss-and-secretary-banter, a delightful role played by Zawe Ashton. A successful mix of suspense, drama, while the plot twists and turns.. Plus there is that wry 'Atkinson humor, dipped in dark melancholy'. Not strictly feel-good stuff. The series is both set and filmed in Edinburgh. The first series premiered in June 2011 on BBC1 and in October 2011 on PBS. A second series is scheduled to air in 2013 and I will be looking forward to that! Rarely I read a book a second time, though I hang on to most of them faithfully; for the simple reason that I have a pile of books waiting to be read. When I started reading in this book I noticed immediately that I'd read it before, but instead of putting it back, I read on and enjoyed it as much as I had the first time. It is that kind of book: it is not all about the plot. 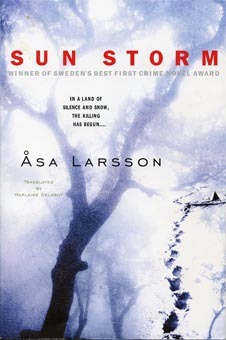 It seems that Sun Storm was published as The Savage Altar in the UK; perhaps that is why I seem to have bought it twice. Rebecka Martinsson, a Stockholm attorney, is heading home to Kiruna (Sweden), the town she’d left in disgrace years before, cast out from a religious community. Rebecka has a good reason to return: her friend Sanna, whose brother has been horrifically murdered in the revivalist church his charisma helped create. The chief prosecutor on the case seems to have already decided that Sanna is guilty and she is charged after vital evidence is found hidden in her home. Rebecka reluctantly finds herself trying to provide legal and emotional support to the emotionally fragile Sanna as well as care for her friend's two daughters and keep everyone safe. Inspector Anna-Maria Mella shares Rebecka's doubts over Sanna's guilt and despite her own very advanced pregnancy, stays working on the case right up to the birth of her own baby. KRO Detectives (TV, Nederland) started recently the crime series 'Single Handed', which is situated in Ireland. I was quite pleased with the first episode, the second episode is scheduled this weekend. The plot of the first episode: Jack Driscoll returns from Dublin to the coastal village he grew up in. As a Sergeant he succeeds his father upon his recent retirement. A demanding job, covering a wide area and 24/7 on call. People in the village consider him an outsider and Jack finds his father walked a fine line in bringing cases to their ends. The crime in this episode concerns a young, immigrant women who died under suspicious circumstance; he finds that she sold sexual favours as she lost her job and had no one to call on for a living. Jack's father has a very different view on how Jack should handle this case and seems to have an interest in closing the book on this without too much fuss. Jack also stumbles on a dramatic family circumstance, which has a dramatic impact on his life. 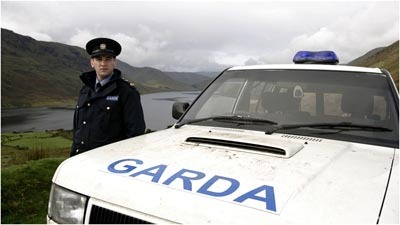 Owen McDonnell was given the lead role of Garda Sergeant Jack Driscoll. The first episode was broadcasted in 2007, the 2nd in 2008, 3rd in 2009 and 4th, 5th & 6th in 2010. These were written by 3 different writers and directed by 5 different directors. These six episodes are referred to as the first series. Sofar four series have been produced and broadcasted (2010 & 2011). Through my own Tumblr.com photopage I stumbled on the spellbinding photography of S.Lee 'MyDays'. Browse his mesmerizing images and be inspired! Arny Raedts (b.1965, the Netherlands) is not your avarage, run-of-the-mill photographer. 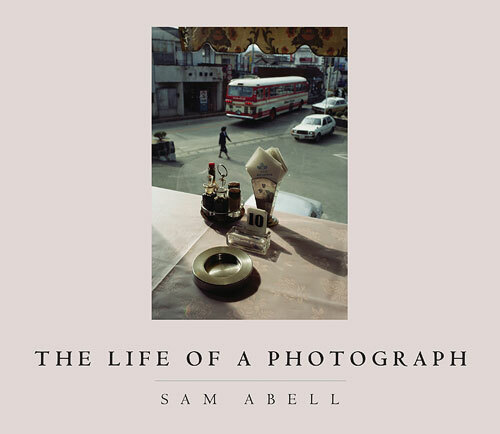 I had my eye out for something on Sam Abell's photography and came recently across this book, 'The Life of a Photograph' (published 2008), in a bookshop in Bangkok (Kinokuniya). And am very happy with the purchase. Sam Abell (b.1945 in Sylvania, Ohio) is an American photographer known for his frequent publication of photographs in National Geographic. He first worked for National Geographic in 1967, and is one of the more overtly artistic photographers among his magazine peers. Sam Abell's love of photography began due to the influence of his father who was a geography teacher who ran a photography club. In his book 'The Photographic Life', Abell mentions a photograph he made while on an outing with his father, a photograph that subsequently won a small prize in a photo contest. He credits that prize as being a major influence on the direction his life would take. The photo and the same explanation is also in the back of this book. Sam Abell's 'The Life of a Photograph' completes a set of 3 volumes, begun in 2000 with 'Seeing Gardens'. It was followed in 2002 with 'The Photographic Life'. Abell's book credits include 'Contemplative Gardens', 'The Inward Garden: Creating a Place of Beauty and Meaning', 'Australia: Journey Through a Timeless Land', and 'Seeing Gardens'. In 1998 he collaborated with author Stephen Ambrose on 'Lewis & Clark: Voyage of Discovery' and again in 2002 on 'The Mississippi: River of History'. That same year, he worked with author Leah Bendavid-Val to produce a retrospective of his life and work titled 'Sam Abell: The Photographic Life'. Two additional book projects, 'Four Stories' and 'The Life of a Photographer', are scheduled for publication in October 2007 and October 2008, respectively. Max Cooper wrote on his blog in 2008 about an interview he did with Sam Abell. MC: So tell me about the new book. SA: Well, it was an outgrowth of a talk I gave a few years ago, which was on 'The Photographic Life', which was the title of my book that came in out 2002. And the light bulb went off in my mind when I said it, and I thought, that should be the next book that I do, it’ll be a natural follow-on to 'The Photographic Life'. 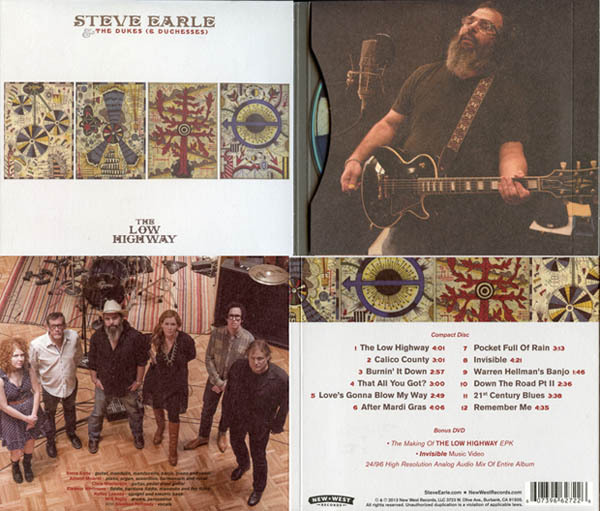 More..
Steve Earle's 15th studio album, The Low Highway (produced this year), is a road record written about what he experienced from the window of his tour bus while traveling across the United States; and he proofs once again to be one of America's greatest living storytellers. You can hear the road in Steve Earle's voice, a craggy rumble with a whole lot of mileage on it. As Neil Spencer of the Observer wrote: "There are blazing rock-outs (Calico County), down-home bluegrass (Warren Hellman's Banjo) and three tuneful songs from Treme. Earle's vocals are often a cryptic Texan growl, but the playing is immaculate and the songcraft admirable." 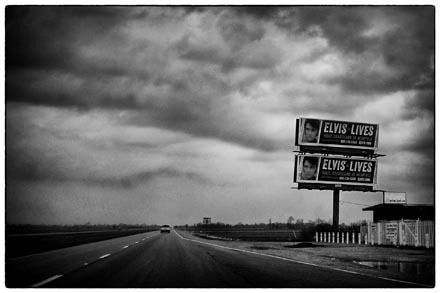 The Low Highway is a nicely produced album: artwork, lyrics and a bonus dvd! The downloaders will lose out here. A great addition to my collection of music by Steve Earle. 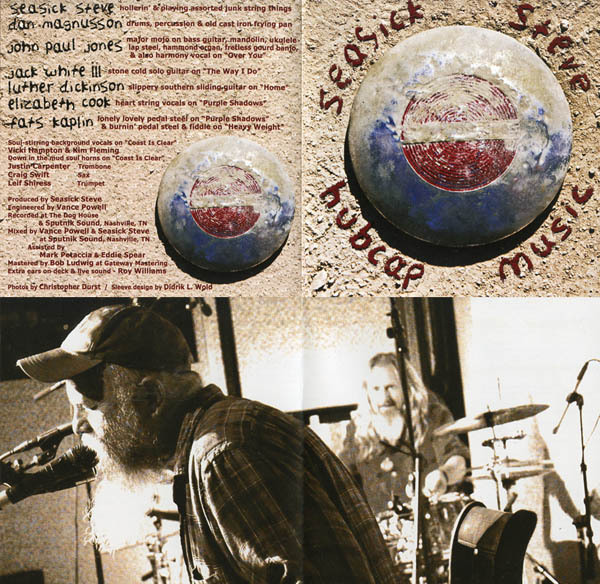 Seasick Steve has another album, his 7th: 'Hubcap Music'. So titled because one of the guitars he uses was made from “two hubcaps and a garden hoe". And the man is in great shape (discovered when he was in his sixties, he is now 72). This album is steeped in gritty boogie, mixing the blues with a some stomping rock. Ride that truck. Jack White and Zeppelin-bass player John Paul Jones contribute. Edinburgh, autumn 2006, and Detective Inspector John Rebus is facing retirement from the police force. 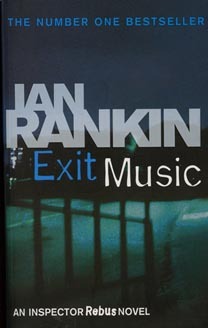 To start with the end, in a way, the title stems from a remark Rebus makes upon receiving DS Siobhan Clarke's gift: an ipod with a choice selection of music on it; his Exit Music. As Rebus tries to tie up some loose ends before retirement, a murder case intrudes. A dissident Russian poet has been found dead in what lookslike a mugging gone wrong. There is a (Russian) link to reality here. Reference is made to Alexander Litvinenko, hospitalised in London and victim to being poisoned by radioactive polonium-210. The rarity of this material would indicate involvement of the Russian government. In Exit Music we see a high-level delegation of Russian businessmen in town, keen to bring business to Scotland; the leading figure, Andropov, may seek a new future in Scotland for political reasons. Rebus spots a link to Big Ger Cafferty and jumps to the opportunity to tie up this particular personal loose end. Things turn out differently and Rebus becomes a suspect of having clobbered Cafferty. One of the notable achievements of Rankin's books has been to create a central figure who is in many ways markedly unpleasant: a pisshead, a bigot, a man who, as someone says in this book, 'doesn't like anyone' - and make him, if not exactly likable, then deserving of sympathy, and even empathy. As Ken Stott portrayed so well for the television series. I have been viewing quite a few Scandinavian crime series over the past few years, and here is another confirmation of high quality crime drama: Unit One ('Rejseholdet'). Produced by Danmarks Radio (DR), the program aired 32 episodes spanning four seasons from 2000 to 2004. 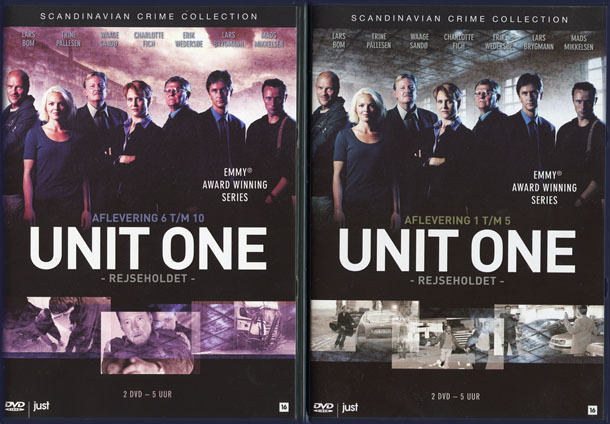 Each episode revolves around an elite mobile police task force called 'Unit One' which travels around Denmark assisting local police solve crimes. The 'Unit One' team are portrayed by actors Charlotte Fich, Mads Mikkelsen, Lars Brygmann, Trine Pallesen, Waage Sandø, Lars Bom and Erik Wedersøe. The 2 dvd boxes each contained 2 dvd's, containing in total 10 hours in 10 episodes. While each episode focusses on solving a crime, the privat lives and/or circumstances play an important role in the story; their every day life sees both tragedy as well as common occurrences such as car trouble. That particular framework of every day life brings it closer to reality. Really enjoyed these series! And if there were 32 episodes I have to find those other 22! Came across this wonderful website of Gabriele Galimberti's fascinating photography. 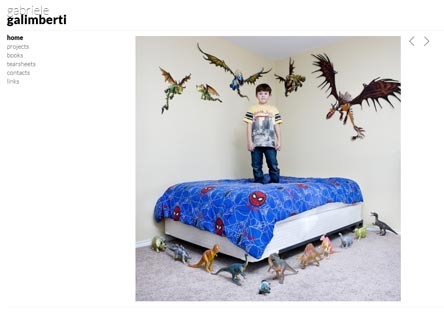 His latest project 'Toy Stories' drew my attention: photographing kids in 50 countries with their toys. Check out his other projects too. 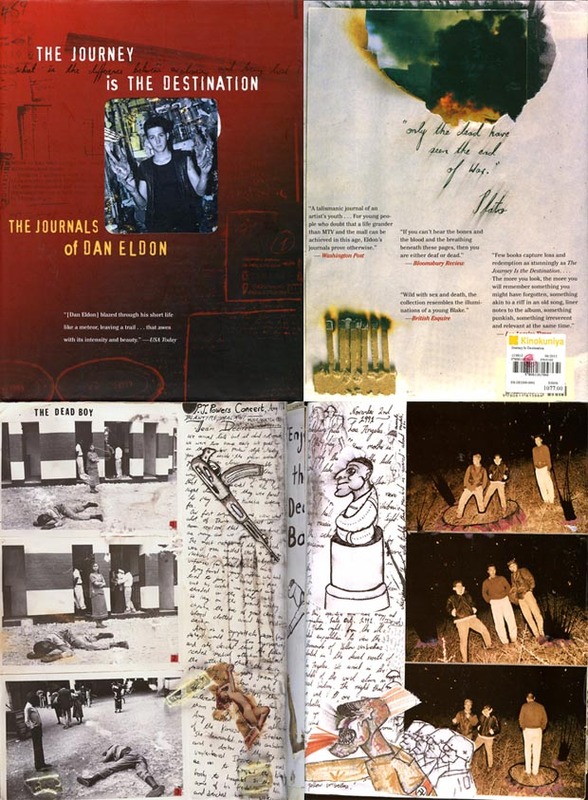 In Bangkok, in the Kinokuniya bookshop (Siam Paragon) I picked up a book which made a huge impression on me: 'The Journey is the Destination - the Journals of Dan Eldon'. A very unique and brilliant book. At 22, Dan Eldon was the youngest Reuters photojournalist ever. Wikipedia writes: Daniel Robert Eldon (18Sep1970 – 12Jul1993) was an English photojournalist, artist and activist. He and 3 colleagues were stoned to death by an angry mob in Mogadishu in an incident before the Battle of Mogadishu (1993). He left behind a series of journals, which his family has exhibited on a worldwide tour. 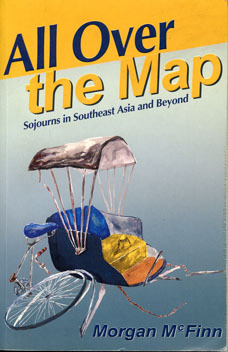 The book is unique in its layout and compilations, it shows many layers of moods, commitments, social studies, anxieties; in many ways a source of inspiration. Eldon's journals are worthy of art, the book is a worthy tribute to a young man with many talents but whose life was cut short in one of Africa's many tragedies. But the Chinese also know their way with deception: for many years each "plenipotentiary' sent by the Emperor to deal with the English problem, spun a yarn and most got away with it. The conflict turned out to be rich in tragicomedy: in bureaucratic fumblings, military missteps, political opportunism and collaboration. 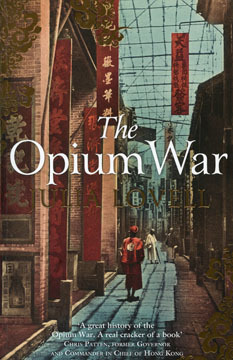 Yet over the past 170 years, this strange tale of misunderstanding, incompetence and compromise has become the founding myth of modern Chinese nationalism: the start of China’s heroic struggle against a Western conspiracy to destroy the country with opium and gunboat diplomacy. The relations of China with the Western World still wears the scars of this episode in history. A brilliant book for its analyses and clarity of historic detail. I picked up this book in a shop selling secondhand books (Dasa Book Cafe) in Bangkok. Since I saw mention of Phnom Penh (and having visited PP a few weeks earlier), and being a fan of 'dry wit' myself, I decided to buy it. The writer does go on a bit and the trouble is: he writes it all down. A rambler rambling. McFinn and the book don't seem to have much purpose and I have to conclude it didn't provide many new insights, though the parts detailing Phnom Penh were of some interest to me.